Part of a chain of orienteering maps in the Teanaway Community Forest, Teanaway Forks (or “Teanaway Valley”) is rugged, challenging, and beautiful. 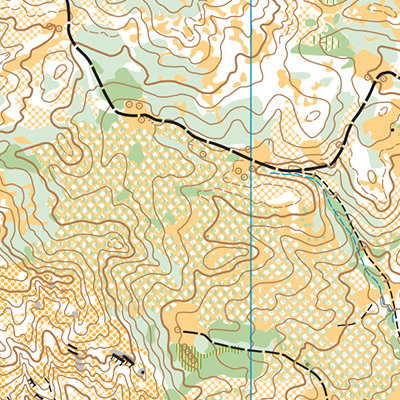 There is a fair amount of contour details and lots of open pine forest and grassland. However, vegetation becomes quickly outdated here, so do not rely on vegetation alone; contours are your best friend! New orienteers should consider choosing a shorter or easier course than usual. Teanaway Forks is rugged and moderately hilly, with some especially steep areas that nice course designers try to avoid. Deadfall on the ground makes running or hiking more strenuous. There is a fair amount of contour details, some of it steep, and some of it more shallow and subtle. The area is predominantly pine forest, mixed with grassland and evidence of logging activities both new and old. However, vegetation becomes quickly outdated here, so do not rely on vegetation alone; contours are your best friend! While there are some large trails to help keep you from getting completely lost, new orienteers should consider choosing a shorter or easier course than usual. 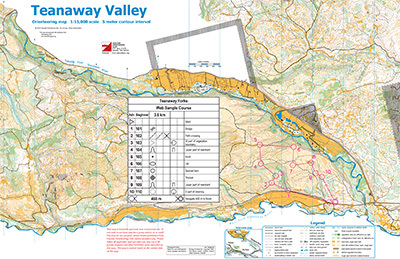 Teanaway Forks is ranges from flat, to hilly, to very steep, depending on what part of the map you’re in. While the open pine forests and grassy areas are considered quite passable when compared to many forests in Western Washington, the amount of deadfall on the ground makes running or hiking more strenuous. Teanaway Forks is typically used for longer events, and participants should consider carrying water and snacks on the course. Turn left onto Teanaway Road, then left onto West Fork Teanaway Road. Continue straight on West Fork Teanaway Road until the pavement ends.